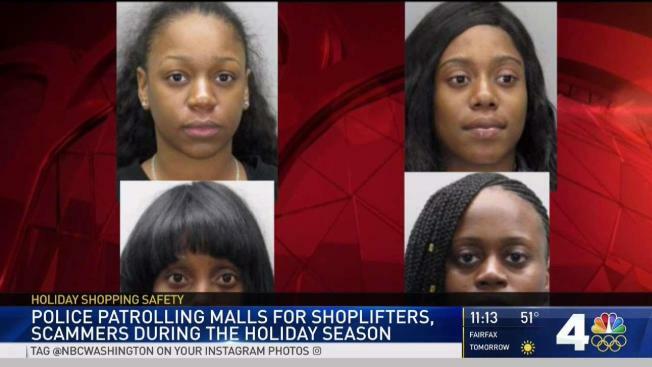 Four women are definitely on Santa's naughty list after police say they were caught stealing $29,000 worth of merchandise from a Virginia mall. Fairfax County police say Glenis Brown, Aleisha Greenwood, Latasha Lawson and Stephanie Winter took the items from 13 different stores at Tysons Corner Center during Thanksgiving weekend. Investigators said the women are part of an organized retail crime group hitting stores across the country. Their alleged crimes led to 23 felony charges and three misdemeanor charges. Police say its Christmas anti-theft teams are working Tysons Corner Center, Tysons Galleria, Fair Oaks Mall, and the Springfield Town Center. Last year, the teams collectively recovered more than $315,000 in stolen merchandise and arrested more than 700 people. Investigators said the women are part of an organized retail crime group hitting stores across the country. News4's Julie Carey reports.